Many stroke survivors have limited mobility and some struggle to get back on their feet and walk. There are certain kinds of exercises, however, proven effective in retraining the body to stand and take that first step. If you provide post-stroke care in Rhode Island for a senior loved one, here are a few types of training to consider. The core is the center of the body from which nearly all movements originate. These complex set of muscles need to be strengthened after a stroke to help survivors regain better control over their movements. Suggested core exercises include seated abdominal crunches, seated back flex, seated lateral spinal flex, trunk rotation, and diagonal trunk rotation. Cardio workouts such as walking on a treadmill or riding a stationary cycle get the heart rate up and are good for the entire body. These aerobic exercises engage the large muscle groups such as the arms, legs, and hips, which help stroke survivors improve overall mobility. Many stroke survivors experience a period of time when they feel unsure of their physical abilities due to a lack of balance and stability. Seniors can begin to regain confidence with exercises that concentrate on the walking rhythm and the proper shifting of weight that coincides with walking. Floor exercises that are performed on the hands and knees with a diagonal rocking motion will help your senior loved one become more balanced and ready to try walking. Endurance training allows stroke survivors to exercise longer during their rehabilitation. Seniors often need to start out slowly, but with the right exercises can build their endurance levels up to a more active level. Stoke survivors can start by lifting small weights and/or using resistance bands to strengthen the legs in either a standing or seated position. 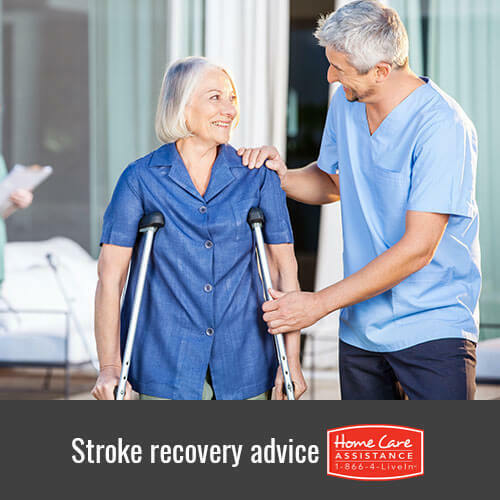 It’s not easy providing comprehensive care for a loved one after a stroke. If you could use help meeting his or her care needs, turn to Home Care Assistance in Rhode Island. Our post-stroke caregivers can run errands, cooking, clean, help with personal grooming and incontinence, and offer both physical and emotional support. Call a dedicated Care Manger at (401) 284-0979 for more information or to schedule a complimentary in-home consultation.